The musicians first started jamming together afterhours among the darkened stacks of Hamilton's Chapter One Book Store in the fall of 2003. Soon, Patrons started not wanting to leave the store at closing time. The band decided that they would have to start giving public performances to satisfy their growing legions of fans. In a panic to find a name, they pluralized the title of their favourite slow tune, and became "The Crested Hens". Since then, they have played on both sides of Highway 93, at the Banque Club and the Exchange on Main St., and the Bitterroot Brewery on Marcus St. Their St. Patrick's Day show of 2005 would surely have sold out, if only someone had been selling tickets. They've also made a number of outdoor appearances, at the Hamilton Farmer's Market (summer Saturday mornings along Bedford St.), and inaugurating the city's 2005 "Tuesday at Twelve" series of concerts in Legion Park. In the winter, they retreat indoors to venues like the Hamilton Playhouse, where they shared the stage with the A Capella Society for a Christmas concert which is still recalled with warm fuzzy feelings by those who were fortunate enough to have been there. Their favourite place to play so far, however, has been the acousterrific Performing Arts Center at Hamilton High School, where they were chosen to play for the prestigeous USFS/Smithsonian touring exhibit Inspirations from the Forest. They've also warmed up the PAC audiences for Lisa Haley and the Zydekats, and a touring production of the play A Couple Of Blaguards. Their travels have taken them to Symes Hot Springs, in NW Montana, as well as An Ri Ra, the Irish Festival in Butte. They kicked off 2007 with a host of other performing artists as part of Missoula's First Night celebration. 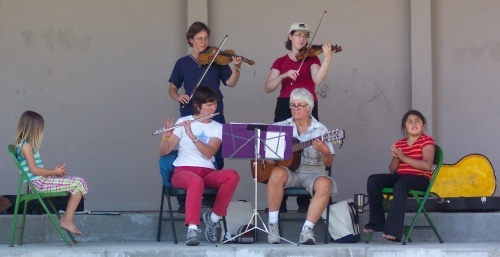 In April, 2007, the Hens held a Contra Dance for Carbon Control, which was a good time for all, and raised $100 for the National Wildlife Federation.